Professor Stuart Hodkinson: is a Lecturer in Critical Urban Geography (Leeds University). His main research focus is on the ‘new urban enclosures’ with specific interest in the politics, policies and day-to-day realities of housing privatisation, urban regeneration and state-led gentrification in the UK. Recent research was an ESRC-funded project exploring residents’ experiences of housing/ estate regeneration in England under Private Finance Initiative (PFI). Sid Ryan: Is an investigative journalist specialising in the NHS, Private Finance Initiative and the Freedom of Information Act. During a Fellowship at the Centre for Investigative Journalism, pursued a project into widespread fire safety defects in NHS hospitals. David Whyte is Professor of Socio-legal Studies at the University of Liverpool. He is an internationally recognised expert on regulation, and has authored 4 books and published 28 peer reviewed articles in prestigious journals on this subject. He is a former member of the Scottish Government Expert Group on Corporate Homicide, is a Visiting Professor at the University of Turku, Finland and the International Institute for the Sociology of Law, Onati, Spain, and is also currently a holder of a Leverhulme Trust Major Fellowship. Joel Benjamin: Is a member of Research for Action researching municipal finance and a former local government planning officer. There is evidence that the context and material circumstances of the Grenfell Disaster can only be adequately understood, if the following questions are answered by the Inquiry. 1 How did deregulation and weakening of enforcement measures drive a culture of risk? 2 What role has political priorities for ‘gentrification’ played in undermining safety-critical regulation at Grenfell? 3 How has division of responsibility for managing Grenfell Tower created safety-critical risks? 4 How did the complexity of the sub-contractor chain in the 2016 refurbishment of Grenfell Tower encourage unsafe practices? 5 What are the lessons of Grenfell Tower for ensuring the future safety of schools, hospitals and housing? 6 What were the implications of a lack of an enforceable Duty of Care or Right to Challenge for social housing tenants? 7 Did ‘Bonfire of the Qangos’ & closure of the Audit Commission compromise probity? 8 Has local government austerity & RBKC tax policy enabled a culture of risk taking? The following sets out the case for inclusion of each of these areas, as substantive aspects of the Grenfell Tower public inquiry, to be afforded due consideration within the terms of reference. In the aftermath of the disaster, over 70 of the leading professional organisations who deal with public safety, including the Royal Society for the Prevention of Accidents (RoSPA), the British Safety Council, the Chartered Institute of Environmental Health (CIEH), and the National Examination Board in Occupational Safety and Health (NEBOSH), wrote to the Prime Minister to “scrap the Government’s approach to health and safety deregulation and think again”. The letter also recognised that this is likely to be the outcome of a public inquiry. Whilst we would not wish to assume the outcome of the public inquiry, there is a clearly a very heavy weight of professional expectation that the inquiry will tackle the issue of deregulation and the so-called ‘bonfire of red tape’. The 2005 Regulatory Reform (Fire Safety) Order, part of New Labour’s Hampton reforms ended certification by fire authorities, and transferred responsibility for safety onto a combination of employer, employee, occupier, and landlord. It is likely those regulations were not sufficient to ensure a comprehensive, safety-critical assessment & may have been significant at Grenfell. CS Stokes Associates, the firm that risk assessed Grenfell Tower, issued a statement following the disaster: “It is very important to stress that these assessments focused on the common parts of the building to the requirements of the Regulatory Reform (Fire Safety) Order 2005, rather than the building’s refurbishment or structural changes.” Questions must therefore be asked about the role of fire risk assessors and whether the regulations are lacking in their ability to prevent similar fires. At Grenfell, the current government’s deregulation strategy may have impacted upon the ability of contractors to ignore regulations and the local authority’s failure to enforce the law. Local authority regulation and inspection have been one of the areas of social protection most universally devastated as a result of the overall 40% public sector expenditure cuts imposed since 2010. This sustained attack has legitimised cuts in all of the national and local regulatory authorities, and a reduction in inspections across the board that raises further questions about how such reductions are now creating unbearable risks. The Health and Safety Executive has had a budget reduction of 47% since 2010, and now the majority of workplaces are exempt from routine inspection. Fire protection has been similarly compromised by the public sector cuts. A report by the National Audit Office shows that between 2010 and 2015 funding for stand-alone fire and rescue authorities fell on average by 28% in real terms. Savings came predominantly from reducing staff costs and reducing audits, inspections, fire risk checks. The result: fire safety checks in tower blocks fell 25% in the most recent 5 years with significant implications for the monitoring and enforcement of relevant standards. All of this raises profound questions about the impact of the undermining of building, fire and health and safety regulation by successive governments, and the ability of under-funded regulatory authorities to fulfill their duties and protect the public. RBKC has been criticised widely for the fitting of cladding as an ‘aesthetic’ measure, part of its gentrification strategy that is aimed at improving the appearance of the building. Certainly, there is evidence that the outward appearance of building was a priority for building enforcement officers in Kensington and Chelsea. In 2015 RBKC embarked on a major campaign to stop construction companies displaying unlawful and ugly advertisements and messages on the side of the buildings. This remains the most publicly visible campaign on building regulation by RBKC in the past 2 years. In other words, law enforcement campaigns have been aimed at enhancing the aesthetic appeal of the area, and maintaining the successful gentrification of the area. The same attention has not been paid to ensuring high standards of building renovation. There are more fundamental reasons to inquire into how a particular ‘culture of gentrification’ caused Grenfell. Concerns have been raised about the close relationship between both the Leader and the Deputy Leader of RBKC Council and their relationship with private development and construction firms, to the extent that gentrification expert Anna Minton has noted: “Socialising between these property men – and they are mostly men – is used to cement ties, and the lines between politician, official, developer and lobbyist are barely drawn. This culture, and the questions of accountability it raises, must be part of the public inquiry into Grenfell.” The question that is being raised here is whether close links between politicians and the construction and property companies has weakened the public interest prior to Grenfell? The way that gentrification shapes local authority priorities raises profound questions about how the re-focussing of regulation can under-value and undermine safety-critical regulation. Since 1996, Grenfell Tower has been managed by Kensington and Chelsea Tenant Management Organisation (KCTMO). Although it is managed by the KCTMO, and any major capital works come under its responsibility, the RBKC Council still owns the properties and retains responsibility for strategic housing policies and for its statutory responsibilities for housing people. The relationship between KCTMO and the Council is governed by a Modular Management Agreement (MMA). There have been questions raised about how the MMA Agreement was breached, resulting in the implementation of an Improvement Plan in 2009, covering a variety of areas, including governance, risk management and audit, structural and performance issues. There are concerns that the regular audits which the TMO is subject to under the MMA focus on more Key Performance Indicators which look at ‘customer satisfaction’ and fewer Performance Indicators which measure the existence and effectiveness of robust checks into safety and regulatory compliance. Those issues raise 3 broader questions about the systemic issues surrounding this arms-length model of housing management. The structure of board-level decision making. We know that the Grenfell Residents association registered a number of complaints about the integrity of fire safety and emergency systems (both hardware and escape planning) prior to the fire. It appears that those clear warnings were too easily ignored by KCTMO. As MP for Kensington and Chelsea, and former board member of the KCTMO has noted, the structure of decision making excludes both residents and opposition councillors from having an effective input. The organisational structure of TMOs and the question of diminished responsibility. Tenants must communicate all of their concerns to the KCTMO, rather than the owner of the building, RBKC. This creates an extra layer of bureaucracy between the ultimate service provider and the service user. The constitutional arrangements governing the TMO itself has a formal guarantee of diminished responsibility that means it is less accountable than the local authority would be if it was directly managing the accommodation. KCTMO is a completely separate company, limited by guarantee, which effectively means that it will be exempt from meeting the losses incurred to tenants. This liability gap further diminishes the weight of responsibility that falls on KCTMO. These issues raise key questions about whether TMOs can be held accountable for public housing in the same way a local authority could in a directly managed relationship, or a more direct form of management by tenants. It appears that under the existing management structure, it was far too easy for the KCTMO to simply ignore the input and concerns of tenants. There are a number of issues in relation to the complexity of the command structure and the supply chain in building renovations here that bear directly on the causes of the disaster. It is not known at the moment how many contractors have been involved in renovating Grenfell tower. News reports state that there are at least 8 known contractors though because of the practice of sub-contracting in construction it is reported that the police had to consult at least 60 organisations involved in the 2016 renovations. Clearly the major questions so-far, in both government response and public debate have centred on the role of the cladding fitted in the 2016 refurbishment. Indeed, discussions around the cladding are a perfect illustration of how risk can be both created and hidden in complex sub-contracting chains. It appears at least two companies in the supply chain knew that what was being fitted carried a risk that either breached the law or was likely to. The company supplying the cladding knew where it was being fitted and knew that it would be unsafe, though later responded that it “was not its role to decide what was or was not compliant with local building regulations.” The company fitting the cladding was a specialist firm with precise knowledge of safety standards and regulations but has passed responsibility up the chain and has publically stated that “the cladding used in the development was as billed in the contract.” If this is true, it would not exonerate Harley, but it could raise big questions about the responsibility of contractors further up the line or a CDM coordinator with oversight. These issues raise key questions about where responsibility can be placed in the supply chain, and whether the complexity of those chains in fact masks both responsibility and accountability, and therefore encourages unsafe practices. Whilst the renovations at Grenfell Tower were not funded by a PFI or PPP type contract, evidence emerging into the public domain following the disaster raises key questions about PFI/PPP. A number of critical questions about the safety of high profile PFI projects have been raised in the past two years. Perhaps most notable amongst those are the emergency evacuation of 17 schools in Edinburgh in 2016 and the finding of an NHS report in 2015 that the first PFI-built hospital, the Cumberland Infirmary in Carlisle posed a major fire-safety risk because of fire compartmentalisation and construction defects, found in 16 NHS Hospitals. A large number of PFI contracts have been found to have similar safety-critical problems as those that caused the Grenfell fire. Whilst this is not a problem exclusive to the PFI/PPP economy, the principles of this economy do appear to intensify the same conditions found in the Grenfell refurbishment contract, namely, they encourage long supply chains, and mask responsibility for safety-critical operations. In the aftermath of the fire, NHS Improvement identified 38 trusts, most of them recently-built PFI hospitals that were not built to adequate safety standards. Many used flammable cladding similar to that found at Grenfell Tower. The principal contractor in the Grenfell renovations, Rydon, is one amongst a number of companies that has grown very quickly as a result of PFI/PPP contracts. Rydon is a contractor on the following high profile PFIs: Chalcots Estate (which had to be evacuated in the wake of the Grenfell fire due to major fire safety concerns); Islington Council contract to conduct renovation and maintenance work on 1900 council and 500 leasehold properties; the MOD’s Allenby & Connaught barracks redevelopment; and the Myatts Field North estate in Lambeth refurbishment repair and maintenance contract covering 477 homes. This rapid expansion has enabled contractors such as Rydon to assume responsibility for a broader set of functions that are safety-critical. The Myatts Field North estate contract, for example, includes Rydon’s role in fire risk assessments and regular inspection of play equipment. Rydon’s role in such major PFI projects is a matter of very acute public concern at the moment. This evidence, much of it only entering public debate since the Grenfell fire, raises profound questions about how the contracted out, PFI/PPP economy is ill equipped to monitor and enforce building and fire safety standards of schools, hospitals and living accommodation. 6 What were the implications of a lack of enforceable Duty of Care or Right to Challenge for social housing tenants? Several legislative bills or amendments were proposed in recent years to improve the condition and safety of social and privately rented housing stock and the rights of tenants. These include the Homes (Fitness for Human Habitation) Bill put forward in 2015 by Karen Buck MP – which sought to widen the matters for which tenants could take their landlord to court (to include health and safety concerns), which was defeated by Government. Ensure tenancies on terms shorter than seven years are fit for human habitation. Including council houses and privately rented homes. Subsequent defeat of amendments to the Housing and Planning Act 2016 proposed by Shadow Housing Minister Teresa Pearce, who intended to get the content of Karen Buck’s rejected bill included in legislation, were rebuffed by then Housing Minister Brandon Lewis, because in his view proposals would impose further “unnecessary regulation” on landlords. In essence, while all council homes are expected to be fit for human habitation, no existing law – including the government’s most recent housing bill – actually allows such standards to be appropriately enforced. Where homes are unsafe and do not meet safety standards, many tenants lack the legal right to challenge their landlord, to ensure the health and safety failings identified are rectified. Forcing social tenants to live in unsafe housing situations, with no legal right to challenge on the basis that it would result in “unnecessary regulation” for landlords represents an egregious failure by the legislature to safeguard the duty of care for social tenants. Thus rendering the tragic events, such that occured at Grenfell Tower, highly probable if not inevitable. Elsewhere, the duty of care to welfare recipients is being removed or made conditional in other areas of welfare provision such as homelessness prevention – placing additional strain on the housing and welfare system and subjecting citizens to further risk of harm. The inquiry must consider the extent to which the failure of Government to ensure a legally enforceable “duty of care” to social tenants, contributed to the Grenfell Tower disaster. 7 Did the ‘Bonfire of the Qangos’ & closure of the Audit Commission compromise probity? In 2010, Communities Secretary Eric Pickles unleashed a “bonfire of the Qango’s” (Quasi-Autonomous, Non-Governmental Organisations) resulting in the closure of the Audit Commission in April 2015, which scrutinised the accounts and spending of local authorities and arms length management organisations such as housing associations. Perhaps the reforms greatest failure, is that rather than removing opaque Qango and ALMO structures that run public services in a non-transparent and unaccountable fashion, it was the body that scrutinised them, the Audit Commission, that was earmarked for closure. External audit duties at local authorities would now be outsourced to BDO, Grant Thornton, Mazaars and the ‘big four’ accountants Ey, PwC, KPMG, Deloitte. The vital role played by the Audit Commission in scrutinising double invoicing and sophisticated cross boundary frauds, now falls to Police and local authorities like Hackney to coordinate and pursue cases such as faulty Grenfell fire alarm firm Lakehouse PLC. Commentators questioned whether the civic auditors would ever materialise or be up to the substantial task at hand. One inevitable outcome of the new audit regime is that external auditors end up scrutinising outsourced local government spending, involving both clients of the council and audit firm. RBKC are audited by KPMG, led by Audit Partner Andrew Sayers, sanctioned by the regulator for pre crisis audit failings. KPMG currently audit Rydon Group Ltd, a leading Grenfell Tower refurbishment firm. KPMG audit the entire PFI consortium, at Chalcots Housing Estate in Camden. Meanwhile, the general public, assumed to take the place of audit professionals, are prevented from accessing financial contracts and spending documents required to perform even the most basic scrutiny functions, and lack both legal standing and financial resources to bring negligence charges against local authorities, even where citizen auditors do expose serious failings. Following Audit Commission closure, what is left is a transparency, scrutiny and accountability vacuum in local government, where arms length management organisations the former Communities Minister railed against, are now free from public scrutiny and enforcement. The inquiry should consider the extent to which removal of effective independent audit and investigative scrutiny safeguards, resulting from closure of the Audit Commission, have or could be perceived to have, weakened disclosure, scrutiny, oversight and financial probity at local authorities and arms length bodies like KCTMO, fostering a culture of impunity. 8 Has local government austerity & RBKC taxation policy enabled a culture of risk taking? Since the introduction of local government austerity and a 40% reduction in funding, councils have repeated the mantra that due to the severity of budget pressures – they have to make “tough choices” in deciding which services to protect and which to cut. Whilst councils have no say over levels of central Government grants set each year by the Treasury which make up around 75% of funding, councils do directly control the rates and collection of council tax. Figures published by the Royal Borough of Kensington and Chelsea (RBKC) in annual reports between 2010 and 2017, when IFS figures show RBKC spending on services fell by 36%, demonstrate substantial falls in council tax income – directly resulting from RBKC policy to lower the council tax. Council tax policy changes can be traced back to a 2009/10 crisis era intervention by Cllrs Tom Fairhead (Finance) and leader Merrick Cockell – to award each resident a £50 rebate to encourage retail spending and support charities in the borough. Following an initial trial, the practice of tax rebates and deliberate council tax cuts became entrenched as an annual “efficiency dividend,” paid to wealthier RBKC residents, as public services were cut or outsourced, and saving realised. Whilst freezing council tax, to offset a deterioration in economic growth conditions was supported by Central Government funding, RBKC went much further, slashing council tax collection by nearly one quarter, relative to 2009/10. Compared to pre-austerity council tax collection benchmark of £96 million in 2009/10 – rates of tax collection dropped substantially to reach a low ebb of £71.5m by 2013/14, when Grenfell Tower refurbishment entered the procurement phase. 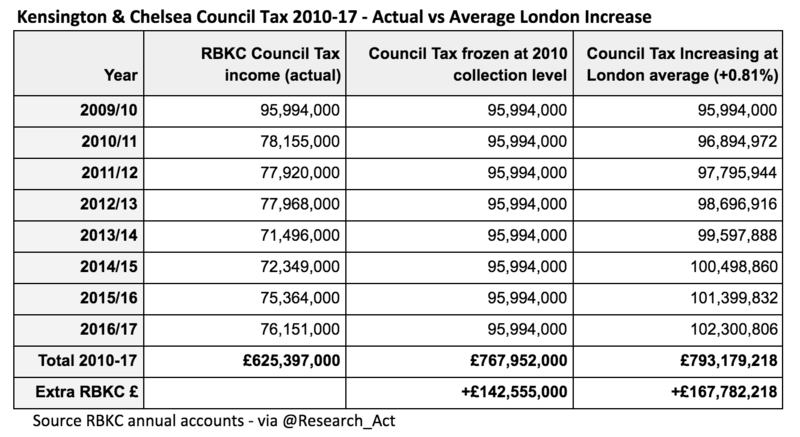 Relative to council tax collection rates at other London boroughs, which on average, increased council tax by 6.5% between 2009/10 and 2017, RBKC slashed its own council tax income via tax a combination of rebates and tax cuts by 21%. Among London Boroughs, RBKC is second only to Hammersmith and Fulham for the scale of self imposed council tax cuts. Hammersmith cut council tax income by 25% over the same period. RBKC income (and spending) between 2010 and 2017 declined as a result of council tax policies, by approximately £142 million (rates frozen at 2009/10 level) to £167 million (average 6.7% council tax increase). Enough money to fund the original scope £10m Grenfell Tower refurbishment, 16 times over. Total spending cuts at RBKC amount to approximately £61m a year, relative to 2010 levels. Had RBKC raised council tax in line with the average for London boroughs, additional income would have reduced annual service cuts by one third, or £20m per year. Alternatively, the amount of council tax income forgone by RBKC could have shielded council residents from the full impact of all spending cuts on services for 2 to 3 years. Rather than shielding residents from services pressures however, RBKC voted to exacerbate the cuts by a further £20 per year. A decision with significant implications for the health, wellbeing and safety of RBKC residents. In particular, poorer residents, typically more reliant upon a range of council services, negatively affected by the cuts imposed. In the wake of the Grenfell Tower disaster, decisions made by RBKC and arms length KCTMO to compromise the safety of social housing tenants on the basis of an over-riding cost savings imperative should be reviewed, in light of available evidence relating to the financial management of the council and sustained council tax cutting policy. Decisions made at Grenfell Tower to trim £1m from the refurbishment budget, and squeeze suppliers to use cheaper, combustible materials, compromising resident safety, were not framed by absolute economic necessity, rather a set of political decisions, made by RBKC – which became a willing participant in additional and unnecessary local government cuts. The inquiry should consider the extent to which cuts to local services and the monitoring and enforcement of safety standards at RBKC were the result of a) central Government austerity policy, and b) RBKC policy to reduce council tax – and the extent to which the likely risks for public/ resident health and safety were considered, and/or mitigated by RBKC, prior to the implementation of cuts and RBKC policy of lowering council tax. Excellent work! All these elements are exactly what combined to cause the “perfect storm” scenario which resulted in the inevitability of the Grenfell Tower fire disaster. They MUST all be investigated independently of National & Local Governments because their corruption & greed knows no bounds & has no conscience. Charitable funds which were raised by the public & intended for the victims of this terrible, avoidable disaster should be accessed for this purpose & used to finance a truly INDEPENDENT inquiry by impartial Experts to find out the real truth & help to prevent this type catastrophe ever happening again to thousands of other potential victims who are currently living in similar situations all over the U.K & abroad. How much money was spent on an inquiry into the Lackanal House fire? They knew changes should be implimented to prevent this happening again but nothing was done!